POKHARA, July 02: Minister of Industry, Environment and Tourism of State 4, Bikash Lamsal, has warned the central government not to interfere in the internal works and affairs of the state. Minister Lamsal warned the central government not to involve itself in state affairs without collaboration and discussion, in a meeting with tourism entrepreneurs regarding the budget for the Nepal Tourism Board. Minister Lamsal said, "With the introduction of Federalism in the country, the central government should not meddle in the state affairs without discussion, as the state government has its own plans and ideas about developing its state." This warning has come amidst the budget issues with the Tourism Board, as the regional office of the Nepal Tourism Board situated at Pokhara has received no part of the 500 thousand rupee budget that it had been receiving yearly for the past 5 years. Coordinator of the Budget Sub-Committee of the Tourism Board, Krishna Kumar Aryal, requested the minister to be clear about the rights of the state government. He said that work in the tourism sector is to be started only after the branding of the tourism regions. 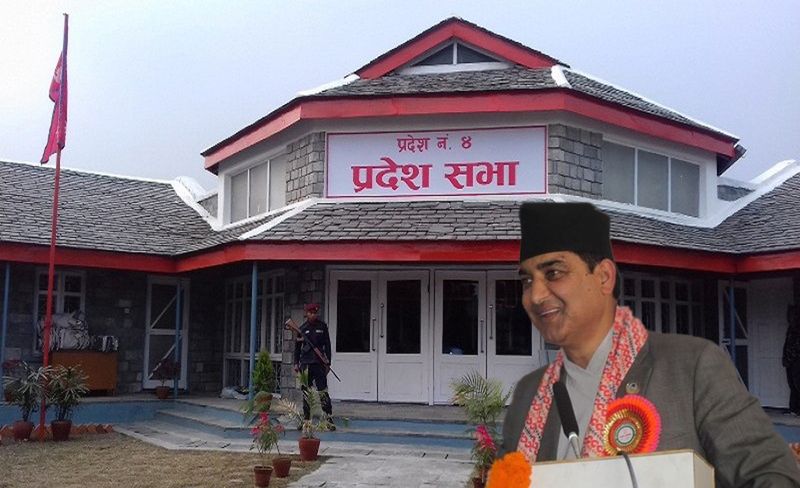 President of the Pokhara Tourism Council, Kedarnath Sharma, also complained that State 4 has not been allocated sufficient budget despite Pokhara being called as the tourism capital of the country. He also demanded that the regional office of the NTB at Pokhara be allowed to spend the budget freely.